Dishwasher Fresh powerfully attacks the hard water residue build-up in your dishwasher and dissolves even the toughest, stinkiest soap scum. Our convenient pre-measured tablets are simple and easy to use and powerfully combat food stains, soap scum, and smelly build up while refreshing your dishwasher and leaving your dishes sparkly clean. Dishwasher Fresh leaves behind a light and clean lemon-fresh scent that lasts for weeks. Use once a month or more/less frequently as required based on usage. Our tablets are environmentally friendly and biodegradable. 1 Package of Dishwasher Fresh contains 3 tablets. 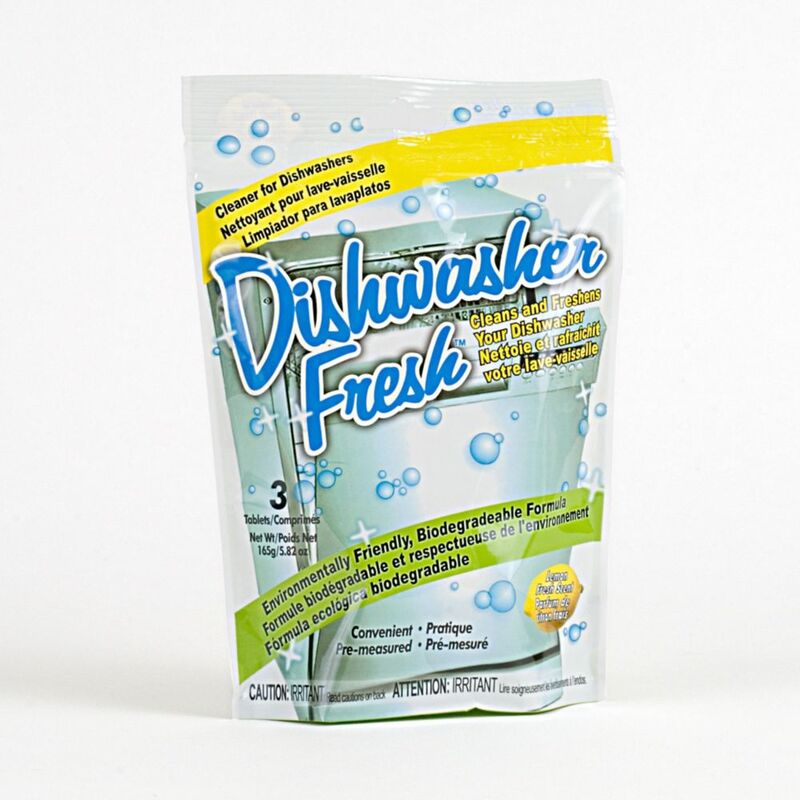 Dishwasher Cleaner & Refresher Dishwasher Fresh powerfully attacks the hard water residue build-up in your dishwasher and dissolves even the toughest, stinkiest soap scum. Our convenient pre-measured tablets are simple and easy to use and powerfully combat food stains, soap scum, and smelly build up while refreshing your dishwasher and leaving your dishes sparkly clean. Dishwasher Fresh leaves behind a light and clean lemon-fresh scent that lasts for weeks. Use once a month or more/less frequently as required based on usage. Our tablets are environmentally friendly and biodegradable. 1 Package of Dishwasher Fresh contains 3 tablets.